By this weekend I supposed most of you would already have your costume dilemma all figured out You have also decided on which awesome and wild party you would be going to before taking your little ones out trick-or-treating. Busted out your big shining scary bowl to hold all assorted candies and regardless of what other people might think of you, you strategize a location to stash your favorite candy. (Yeah, I don’t do that) However if you’re like me and wild parties aside, you would probably stay in, rent some scary movies, or watch Halloween movie marathons on cable with a lots of candies. Sounds good right? So, being in the spirit of Halloween, I made a batch of candy corn. Now, before you begin making your candy, I would suggest clearing your calendar or check your to-do list because this can take all day. Now, I made half the recipe and it still took me a long time to complete and I had a ton of candy corn. Combine sugar, corn syrup, honey, butter and vanilla over medium high heat in a large heavy saucepan, and bring it to over for 5 minutes. Stir occasionally, Remove for heat and then add in the sifted powdered sugar, milk and salt to the pan and continue to stir until it is well blended. Allow the mixtures to cool down a little or until it is slightly warn to touch. Divide the sugar dough into 3 equal pieces into small bowl. 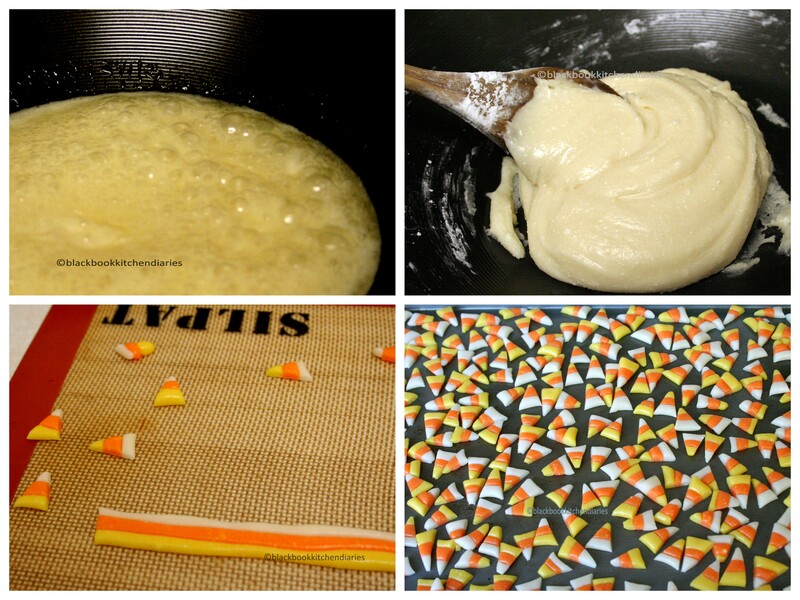 Color each dough to replicate the candy corn. Yellow and Orange. Leave the last dough white. Knead each dough until smooth. Then roll each piece into a thin rope, push the three ropes together to form a long rectangle. Then using a rolling pin, roll it down a little to slightly flatten the surface. Now, cut the ropes into triangles using a very sharp knife. Store in airtight container. You may separate the layers by using waxed paper or parchment paper to prevent from sticking. I am impressed that you made your own candy corn! It looks beautiful. I’m curious… how do they stack up next to the bagged version? Is the taste very similar? They look adorable! UN_BE_LIEVE_ ABLE!!! Truly. I bow to you. Pretty cool – the candy corn looks great. Not sure that I could pull it off. Enjoy your scary movie fest this weekend. We’ll be doing some of that over here too. on October 28, 2010 at 9:49 pm | Reply Julie M.
I was just talking about this with someone today! She said she had made her own candy corn and that it was great. I NEED to try it. Yours turned out fabulous! Awesome job! I am obsessed with candy corn. We go through a really ridiculous amount in my house during the Halloween season. These homemade ones came out so good! I can eat them all! These look so pretty :), I wish we celebrated Halloween more over here. How cool is that! Candy corn is hard to get and very expensive here, and I always wondered what it tasted like. I also was not sure if it contained real corn! I will now have to try and make my own. I have an award for you on my blog. Come check it out. They look so cute! This is a perfect treat for this festivity. Wow you have some patience! I don’t think I have ever eaten candy corn or wanted to until now. wow, those are so pretty! great job! How cool is that? I am really impressed, they look awesome! That is very cool!! So fun too! Thanks! It NEVER had occurred to me I could make my own candy corn! You evil woman! JK…it’s just that I like making anything from scratch that I can and now I need to add this to the list. Absolutely stunning photography. olala…these are homemade? wow you are amazing! Holy crap, that’s amazing that you made your own candy corn! I’m not a fan of candy corn just because I think they are all stale tasting, but I think I would like these fresh homemade ones. Oh my gosh, you had me fooled! I thought the pictures were of storebought candy corn, but I’m REALLY impressed that you did this from scratch – Way to go! And, on the topic of candy, I just posted about some sea salt caramels that I think you’d like, too! Wow! I never thought of making candy corn at home either. I’m not a fan of the stuff you buy the store because I think it is flavorless. I can imagine these could be adapted to many different flavors too. Very creative! Congratulations. Awesome, these morsels look so much better than the waxy store-bought junk! Those are the prettiest candy corn I’ve ever seen. Seriously. You’re amazing making you’re own. I bet yours are a thousand times better than store bought, preservative induced ones. I think it is SO great you made your own candy corn! Very cool! They turned out beautiful BTW! I know many don’t like these candies…but I would say for every ONE that does NOT….FOUR do! You made your own candy corn? How cool is that? Fabulous job! 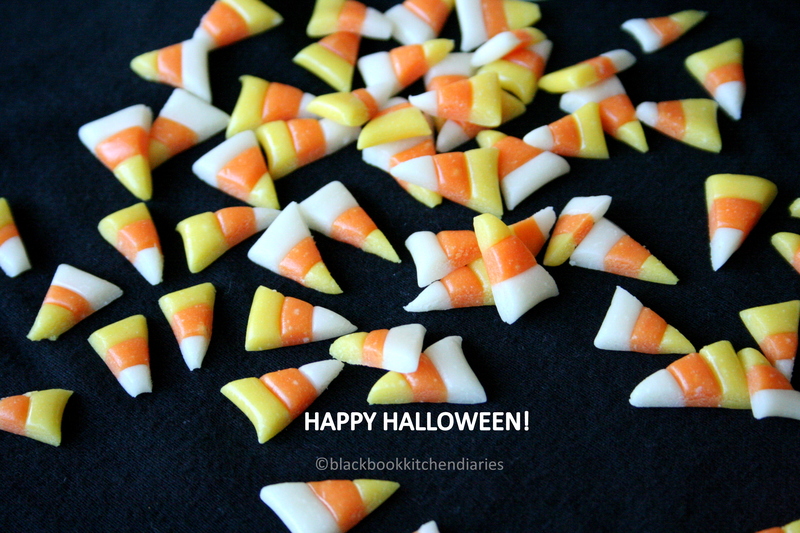 Seriously impressive & you’ve made amazing little candy corn too…, they look great. I’m so impressed you made your own candy corn! That is amazing! I bet it was delicious – 100x better than store bought! on October 29, 2010 at 11:38 pm | Reply Simran S. & Stacie D.
I think my daughter would actually love me more if I made these at home! These are just stunning! Candy corn is my FAVORITE Halloween treat, so I’m thrilled. Thank you for sharing, and I’m sorry if I’ve been a bit sparse here lately…we are going through such a trial. Thank you for all your kind words on my own blog. They mean a lot! Wow, amazing! They look so pretty! wow, I can’t believe you made those! very impressive! These candy corns are majorly impressive! I don’t think mine would ever come out as cute as yours! Wow, that’s so cool you made your own candy corn! (: Thanks for the recipe. We had a lot of fun making these this week, too. That’s pretty freaking impressive. I would never have that patience! You made candy corn!!! I am so impressed! That is my favorite Halloween candy. Great job….they look delicious:) Happy Halloween. I’ve always wondered how to make these classic halloween treats. And I agree I would much rather sit at home watching scary movies! And I just remembered I haven’t bought any halloween candy! Oh my. What a fun all-day project! I can;t believe you made your own candy corn! So cool! I’m not sure I have enough ambition for this, but I’m impressed. WOW! Yesterday they were were showing how and when this was made at the company; you are good! How cool is this? Thank you very much for this recipe. I’ll make it through out the year too. Oh wow, homemade candy corn! That is AWESOME. Happy Halloween! I’m sure you had plenty of double visits!!! So fun! 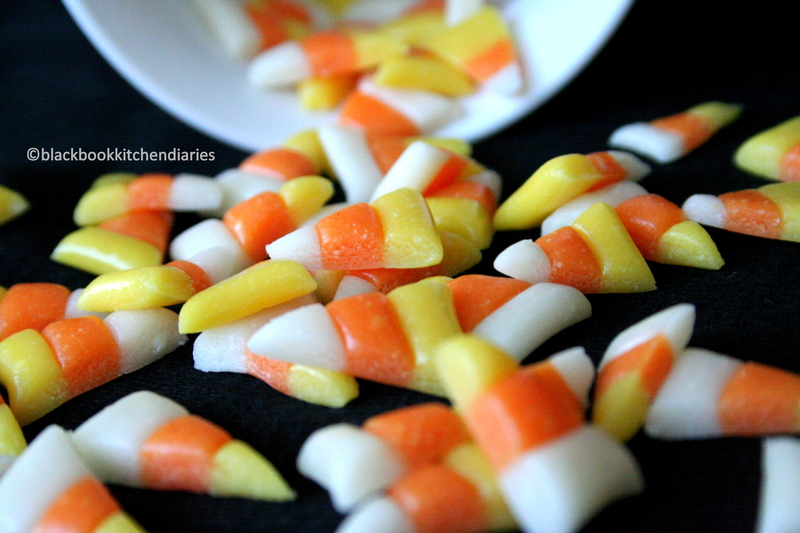 And I consider candy corn a treat through Thanksgiving, so I want to make up some of this! wow, wow, wow, wow, i cannot believe you made candy corn! i am terribly impressed! eee, these are so cute!! I’m TERRIBLY impressed! These are AMAAAZING! Wow and wow again! I’ve had a love affair with candy corn since my grandfather used to treat me to it when I was a child, and frankly it’s still my favorite candy. It never occurred to me that it could actually be made at home, as you have so beautifully done here. Must, must make this soonest! These are awesome! I always thought the store bought candy corn was gross but I’ll bet these are tasty!